God spoke to Moses and said to him, “I am the Lord. 3 I appeared to Abraham, to Isaac, and to Jacob, as God Almighty, but by my name the Lord I did not make myself known to them. 4 I also established my covenant with them to give them the land of Canaan, the land in which they lived as sojourners. In Exodus 5, Moses faces his first setback as the leader of Israel. 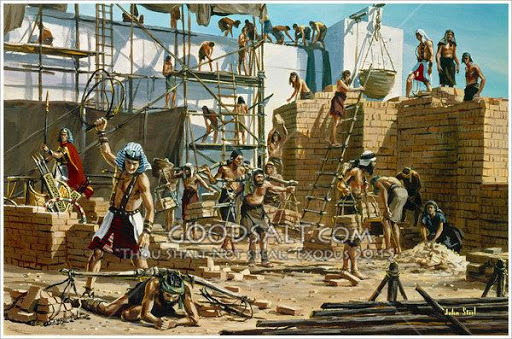 When Moses goes to Pharaoh and appeals to him to let the people of Israel go, he not only refuses but inflicts a greater burden on the Israelites by forcing them to make bricks without straw. And Moses cries out to God, complaining that his efforts made things worse. So Moses was distraught, and asked God why he was the one sent and why all of this was happening to Israel. When things go wrong in our lives or we see brokenness in the world, we question: Why has this happened? Why is the world this way? Why can’t we fix these problems? These are important questions but where can we find the answers? Google, Wikipedia, and Alexa can’t help us; we must go to God. But, like in this passage, God doesn’t usually give us the satisfactory answers that we want or we think we need. Instead, when we go to God with our questions and complaints, God offers Himself. When God tells Moses, “I am the LORD,” He is first telling Moses that He is sovereign and almighty. In his difficult circumstances, Moses needed to understand that God was in control. Also, God wanted Moses to know that as the LORD, He was faithful, the same God who made a covenant with Abraham and the other forefathers. As we face setbacks, failures, and trials in our lives, let us turn to God and remember that He is the LORD. We might not ever fully understand why things are the way they are, but no matter what, let us remember that we can trust in Him and know that He is faithful and is in control. Prayer: God help me to recognize that You are the LORD today. Help me to trust and know that You are faithful and that You are sovereign over my life, no matter the circumstances. AMEN. Read Ecclesiastes 12:13-14: The end of the matter; all has been heard. Fear God and keep his commandments, for this is the whole duty of man. 14 For God will bring every deed into judgment, with every secret thing, whether good or evil. What does Ecclesiastes conclude about how we should live? How can this be an unsatisfactory answer for people? How does it feel for you? How do we understand fearing and following God as good news? In the end, we should fear God and keep His commandments. This can feel overly simplistic because we have a lot of ideas about how we are meant to find fulfillment and purpose through our accomplishments, family, or many other things. Also, for many people, they may feel that the idea of fearing God and following Him makes us sound like mere servants or slaves. It’s good news because it means we no longer have to live for ourselves or our world’s standards of success or joy, which leave us running dry. When we fear God and follow His commandments, we are submitting ourselves to a life of eternal joy, hope and relationship with our heavenly Father. Like Moses, many of us are faced with failures and setbacks in life. In the midst of all of them, what we must remember is that God is God, and that He is sovereign and is faithful. As you close out your day, take a moment and remind yourself of the truth of who God is, and that He is with you no matter what.